Background: Myocardial infarction (MI), the most common cardiovascular disease, has assumed an epidemic proportion today. Higher prevalence of MI is reported from India (a low-middle income country) with the state of Kerala topping the list. Limited data exist on the impact of psychosocial factors on MI in India. Materials and Methods: A total of 100 cases (with MI) and 100 controls (without MI and matched for age and gender) were selected using consecutive sampling from a tertiary hospital in Trivandrum, Kerala, India. 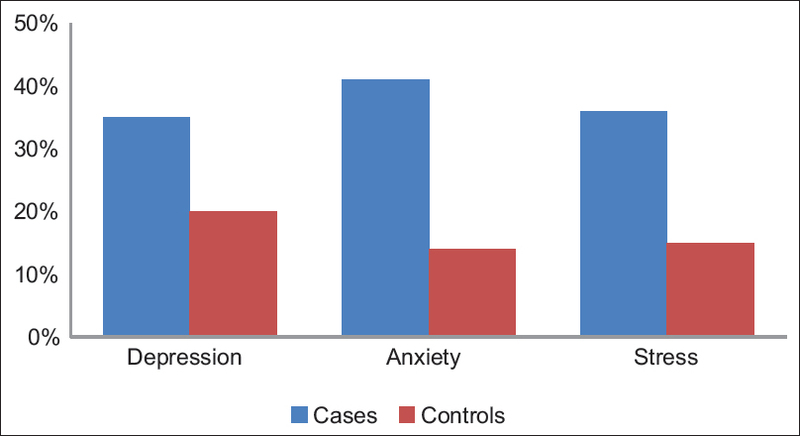 Data on depression, anxiety and stress were collected using the depression, anxiety and stress scales (DASS 21). Chi-square test was used to study the association of the variables under study with MI. Multivariate logistic regression was used to control for confounders. The unadjusted and adjusted odds ratios (OR) and 99% confidence intervals (CI) were estimated. Results: Depression (35% vs. 20%, P = 0.024), anxiety (41% vs. 14%, P < 0.001) and stress (36% vs. 15%, P = 0.002) had a statistically significant association with MI on comparing cases vs. controls. Higher levels of depression, anxiety and stress were associated with an increased risk of MI with OR of 2.790, 6.429, and 3.470, respectively. Conclusion: Depression, anxiety and stress were associated with MI. Prospective studies are required to confirm our findings. Background: The high prevalence of acute coronary syndromes (ACS) and the imminent transition of a proportion of the population into the geriatric age group are issues vital to the health-care delivery system. We wished to compare the risk factors, clinical presentation, echocardiographic and angiographic findings, complications, and in-hospital outcomes of ACS in the elderly and the younger population and identify the predictors of mortality in the elderly. Materials and Methods: This observational cross-sectional study was performed on patients hospitalized with ACS over a 12-month period. Demographic, clinical, and laboratory data of all included patients were analyzed after categorizing them as Groups I (>60 years; n = 188) and II (<60 years; n = 123). Results: Congestive heart failure (n = 64; 20.6%), shock (n = 19; 6.1%), and arrhythmias (n = 9; 2.9%) were observed at presentation in the 311 patients studied. Intervention was not undertaken in 18/311 (5.8%) either due to poor general condition or refusal by the patients' attendants. The risk factors significantly associated (P < 0.05) in Group II included male gender, tobacco and alcohol use, central obesity, dyslipidemia, and a positive family history of coronary artery disease (CAD). Group II had significantly higher (P < 0.05) Killip class, heart failure, and shock at presentation and mortality. Conclusion: The risk factors of CAD differ in the elderly; also they are predisposed to adverse outcome as compared to the younger people. Mortality among the elderly is significantly higher in those with arrhythmias, shock, low diastolic blood pressure, and/or congestive heart failure with advanced Killip class. Background: Spiritual care therapy has been shown to improve the well-being in chronic diseases such as cancer or psychiatric illness. The present study was conducted to evaluate the efficacy of spiritual care in patients with coronary artery disease (CAD) undergoing percutaneous transluminal coronary angioplasty (PTCA). Methods: An open-label, clinical study randomizing patients undergoing PTCA to receive either standard of care alone or spiritual therapy with standard of care was carried out. Spiritual care therapy includes spiritual counseling and holy name chanting before angioplasty and holy name chanting over a period of 14-day postangioplasty. Clinical examination, functional assessment of cancer therapy-general well-being (FACT-G) and functional assessment of chronic illness therapy-spiritual well-being (FACIT-Sp), Hospital Anxiety and Depression Scale (HADS) were performed before the procedure, 24 h and 14 days after PTCA. Inferential statistics was used to assess the statistical significance of the outcome measures. Results: Significant reductions in the systolic blood pressures, FACT-G and FACIT-Sp were observed at both 24 h and 14 days following angioplasty in the spiritual care group but not in the control group that received standard of care. Significant reduction in the anxiety and depression scores of HADS in the spiritual care group was also observed as compared to control group at both the follow-up periods. Furthermore, a significant shorter length of hospital stay and lower levels of high-sensitivity C-reactive protein was observed in the spiritual group. Conclusion: Spiritual care therapy can be part of treatments regime among CAD patients undergoing PTCA as it improves general as well as spiritual well-being and reduces hospital anxiety. Introduction: Coronary artery disease is an important public health issue in India. Over the last few decades, several studies have led to an understanding of the disease with respect to Indian population. 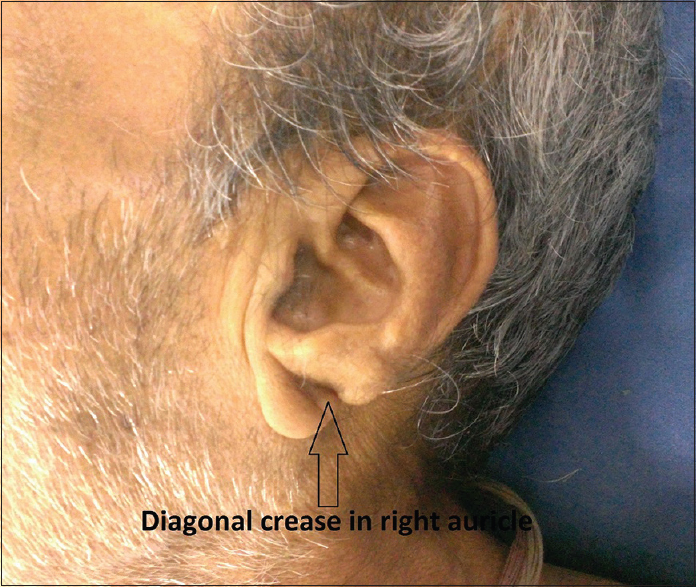 However, lacunae still exist in several aspects of this burning health issue. There is a lack of data on acute coronary syndrome (ACS) in the young Indian population. Our study targeted an important subgroup of Indian population which is the young Indian women. In this study, we present a brief overview of the clinical and laboratory characteristics of young Indian women who presented in our Institute with ACS. Methods: A total of 63 female patients aged ≤45 years with a diagnosis of ACS after satisfying inclusion-exclusion criteria were chosen for the study. Baseline demographics, laboratory investigations, electrocardiogram, echocardiographic assessment, and coronary angiogram with subsequent treatment approach and outcomes were recorded. Results: Dyslipidemia was the most common prevalent risk factors among the study patients, while diabetes and hypertension were other common risk factors noted. Among 63 patients admitted with ACS, 77% (n = 21) received primary percutaneous coronary intervention (PCI) and 11.1% (n = 7) received thrombolytic therapy. The average duration of hospital stay was 4 ± 1 day. Conclusion: It was observed that dyslipidemia was major risk factor for ACS among young Indian woman included in our study. Other risk factors included diabetes mellitus and hypertension. Chest pain (95.2%) was the most common complaint. In 76% cases, the coronary angiogram revealed single vessel disease with left anterior descending coronary artery being the culprit vessel in 69.8% cases. Majority of the participants had preserved left ventricular function at the time of discharge. Nearly 85% of our patients received PCI as the revascularization strategy of choice. Background: Radiation exposure in cardiac catheterization laboratory (cath lab) is a health hazard not only to the interventional cardiologist, but also to the support staff as well as the patients. Data about radiation exposure in cath lab are lacking in India. We undertook this study to observe the radiation trends in a high-volume cath lab at a tertiary care center in India. Materials and Methods: A prospective study of radiation trends in the cardiac catheterization laboratory was carried out with regard to mean fluoroscopic time (FT, minutes), mean total cumulative dose (Gy), and mean dose area product (DAP) (Gycm2). Radiation exposures in various diagnostic and interventional procedures with respect to the above three parameters were studied. Radiation exposure in transradial and transfemoral routes was compared in the subgroup analysis. Results: A total of 2016 cases in which cath lab procedures were done during the period of 1 year were included in the study. Mean DAP for coronary angiography was 23.72 Gycm2 and for percutaneous transluminal coronary angioplasty (PTCA) was 196.61 Gycm2. If the complex PTCA procedures were excluded, the mean DAP was 33.19 Gycm2. Radiation trends observed in our study were comparable to the international standards. Conclusions: Radiation exposure in cath lab is a health hazard and must be given due importance. By maintaining radiation hygiene and associated precautions, the radiation exposure in cath lab can be kept within acceptable limits as shown in our study. Takotsubo cardiomyopathy (TCM) is a form of transient systolic dysfunction that masquerades myocardial infarction clinically. We report a case of a 57-year-old female with a normal cardiac profile who underwent an abdominal surgery. However, immediately after the operation, she developed chest pain and dyspnea, ST-segment elevation and QRS complex widening on electrocardiography, and increased left ventricle diastolic diameter, apical ballooning, and decreased ejection fraction on two-dimensional echocardiography. 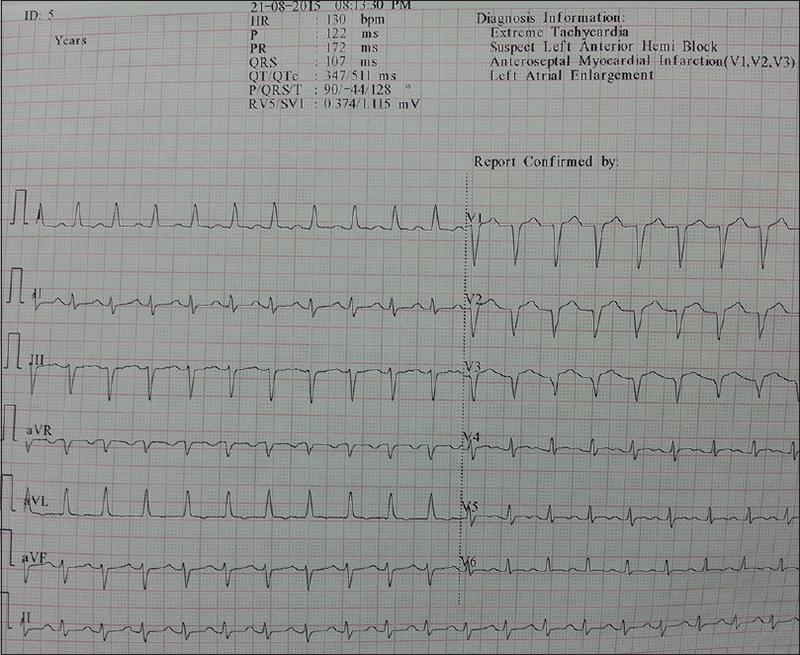 However, coronary angiography was normal. Based on these findings, she was diagnosed with TCM. She was started on diuretics and beta-blocker, and her heart function returned to normal within 2 weeks. Possibility of TCM should be kept in mind when acute coronary syndrome like manifestation is immediately preceded by a stress episode, like in this case. Today, heart failure with preserved ejection fraction (HFpEF) remains one of the toughest Gordian knots in cardiovascular medicine with no visible effective and acceptable therapies. Owing to the complexity, urgency, and gravity of the problem of HFpEF, the present article has been divided into two parts – Part I deals with the description of the problem, and in Part II, the authors suggest innovative methodologies to deal with the problem globally. All the while we have been searching for a size which fits HFpEF, a less understood complex syndrome due to maladaptive changes in structural, functional, and biochemical aspects of the myocyte. Inflammation appears to be the underlying string which weaves together nitrosative/oxidative stress, endothelial dysfunction, downregulation of nitric oxide (NO) bioavailability/NO-mediated signaling, impaired myocardial bioenergetics, disturbed calcium handling, and concentric hypertrophy. Most of the HF with reduced EF (HFrEF) randomized controlled trials (RCTs) are positive, while the majority of HFpEF RCTs are either neutral, borderline, or negative leading to a huge vacuum in the therapeutic space of HFpEF. While few understand the statistical complexity of RCTs, many pretend to do so. Endeavor has been made in the present article to make the underlying concepts loud and lucid without going into statistical complexities. 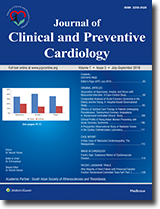 Attempts are being made to negotiate this problem by adopting/experimenting with innovative designs, enrichment trials, adaptive trials, umbrella trials, basket trials, and machine learning-based trials leading to what may be termed as “precision medicine, precision diagnosis, and precision therapy.” We have compared two recent negative HFpEF RCT's (TOPCAT trial - Treatment of Preserved Cardiac Function Heart Failure with an Aldosterone Antagonist, INDIE trial - Inorganic Nitrite Delivery to Improve Exercise Capacity in HFpEF) with one positive HFrEF RCT (CASTLE AF trial - Catheter Ablation Versus Standard Conventional Treatment in Patients with Left Ventricular Dysfunction and Atrial Fibrillation), one negative HFrEF RCT (IRONOUT HF trial - Oral Iron Repletion Effects on Oxygen Uptake in Heart Failure), one positive HFmEF / HFpEF randomized, parallel-group, blinded, multicenter trial (REDUCE LAP-HF TRIAL Phase 2: A Study to Evaluate the DC Devices, Inc. IASD™ System II to REDUCE Elevated Left Atrial Pressure in Patients with Heart Failure), one positive HFmEF / HFpEF non-randomized, multicenter, open label, single arm study (REDUCE LAP-HF TRIAL Phase 1: A Study to Evaluate the DC Devices, Inc. IASD™ System II to REDUCE Elevated Left Atrial Pressure in Patients with Heart Failure) in order to understand why majority of HFpEF Clinical Trials fail.